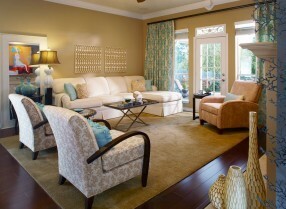 Next to the kitchen, the living room or great room has to be the heart of the home. You host guests there, lounge with the family while hanging out, watching TV, munching or simply sharing life! That's why getting the most out of your living room interior design project will be critical. It's important that everyone enjoys spending time in this space and that it functions well. Some things to consider, is your room large or small? Does it have multiple traffic patterns? What exposure to the sun, is it a southwestern light? Do you have one large window or several smaller windows? Does your living room have a natural focal point? What do you like and what don't you like about your living room/ great room? Do you need storage? Let's use the room below for a living room makeover. This room has two traffic patterns. 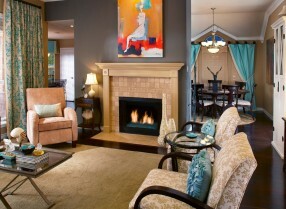 A focal point in the room is the fireplace. This room has plenty natural light and is not a very large room. The floor to ceiling windows and door increase the visual size of this room. First, by creating a small opening in the fireplace wall the living room, dining and kitchen appear to become one. 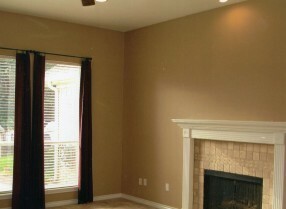 The fireplace wall stands out because of the contrasting paint color. The steel gray compliments the warm yellow of the existing walls and the warm beige of the existing fireplace tiles. Painting the mantel a creamy, warm beige ties the fireplace and mantel together. To anchor this floor plan a dark espresso wood floor was selected with a beige, sandy colored area rug. The simple area rug creates a simple back drop for the other patterns that have been selected for this living room/ great room. A TV has not been chosen for this room but one could be easily worked into the overall interior design scheme. Espresso elements have been repeated in this room on the furniture and the drapery rod tying in the the darker wooden floor. View our entire collection of expert articles relating to all areas of interior design.